“Gay rights are human rights,” says Hillary Clinton, announcing that the US will use diplomatic tools to promote LGBT rights. 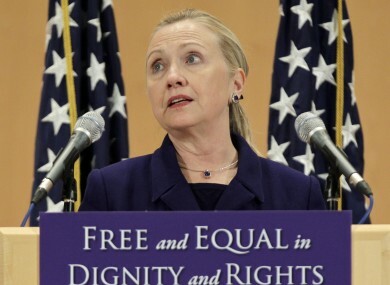 Hillary Clinton announced a new diplomatic push for gay rights at a UN conference in Geneva. THE UNITED STATES has announced new plans to use its diplomatic powers to promote gay rights around the world – including possibly making foreign aid payments conditional on legal change. Secretary of State Hillary Clinton told a meeting of the UN’s Human Rights Council in Geneva that it should “never be a crime to be gay”, adding that a country’s religious traditions were not an excuse to discriminate against others. AP reported that many ambassadors who were attending the summit immediately rushed out of the room as soon as Clinton had finished speaking. In a follow-up statement, the White House described its new diplomatic offensive as its first strategy “to combat human rights abuses against gays and lesbians abroad”. The struggle to end discrimination against lesbian, gay, bisexual, and transgender persons is a global challenge, and one that is central to the United States’ commitment to promoting human rights. The new policy has also been seen as a way of helping Obama win support from the US’s own gay and lesbian communities ahead of his drive for re-election next year. One prospective Republican opponent, Texas governor Rick Perry, described the proposals as a “silly idea” and accused the Obama administration of waging “war on traditional American values”. “President Obama has again mistaken America’s tolerance for different lifestyles with an endorsement of those lifestyles. I will not make that mistake,” the Daily Telegraph quoted him as saying. The US developments follow indications from the UK last week that it too could cut aid to “anti-gay” countries, with David Cameron insisting that countries receiving western aid should offer “proper human rights” for all. Email “US could make gay rights a condition of foreign aid”. Feedback on “US could make gay rights a condition of foreign aid”.